Plant hormone gibberellin (GA) promotes juvenile-adult phase change in higher plants. To confirm the functions of GA in rice, I used dwarf mutant d18-dy. d18-dy is a loss-of-function allele of D18, which encodes GA3ox2. 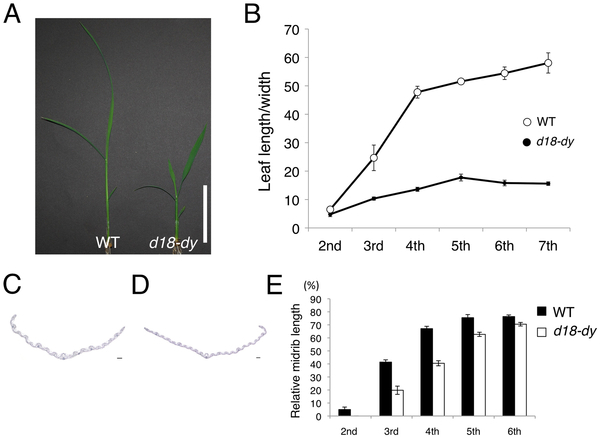 d18-dy mutant exhibited long juvenile phase in morphological traits such as the size of the shoot apical meristem (SAM), shape of leaf blades, presence or absence of midribs and node–internode differentiation in stem. In contrast, expression patterns of juvenile-adult phase change markers miR156 and miR172 were similar between wild type and d18-dy. In addition, d18-dy mutation and GA did not affect expression levels of downstream genes of miR156. 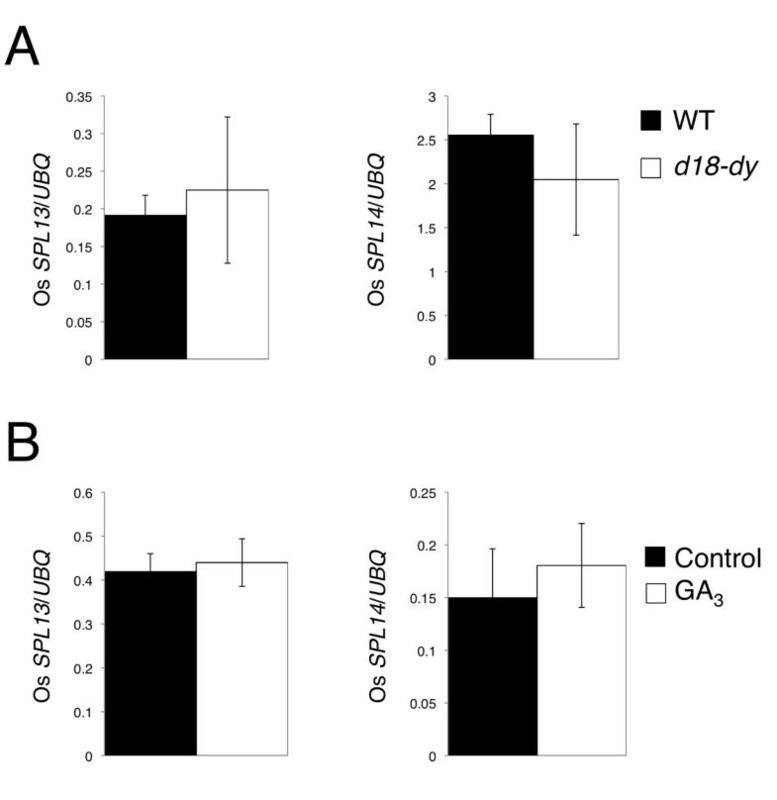 GA does not function upstream of miR156 in juvenile-adult phase change. Juvenile and adult phases are distinguished by several morphological markers (Lawson and Poethig 1995; Telfer et al. 1997; Asai et al. 2002). Juvenile-adult phase change is regulated by miR156, miR172 and gibberellin (GA) in many higher plants (Lawson and poethig 1995; Telfer et al. 1997; Wu and Poethig 2006; Wang et al. 2011; Tanaka et al. 2011). However, the molecular mechanism involved in the juvenile-adult phase change is still unclear. In Arabidopsis, juvenile leaves are round without abaxial trichomes, and adult leaves are long and serrated with abaxial trichomes (Telfer et al. 1997). In maize, leaves have epicuticular wax in juvenile phase, and adult leaves have no wax (Lawson and Poethig 1995). From these morphological markers, a lot of juvenile-adult phase change related mutants are reported in Arabidopsis and maize (Moose and Sisco 1996; Chuck et al. 2007; Schwarz et al. 2008; Smith et al. 2009). The observation of these mutants revealed that miR156 had significant roles in juvenile-adult phase change (Wu and Poethig 2006; Chuck et al. 2007; Wu et al. 2009). In the early vegetative stage, transcription level of miR156 exceeds that of miR172, whereas in later vegetative stage, the inverse pattern is seen (Wu and Poethig 2006; Chuck et al. 2007). 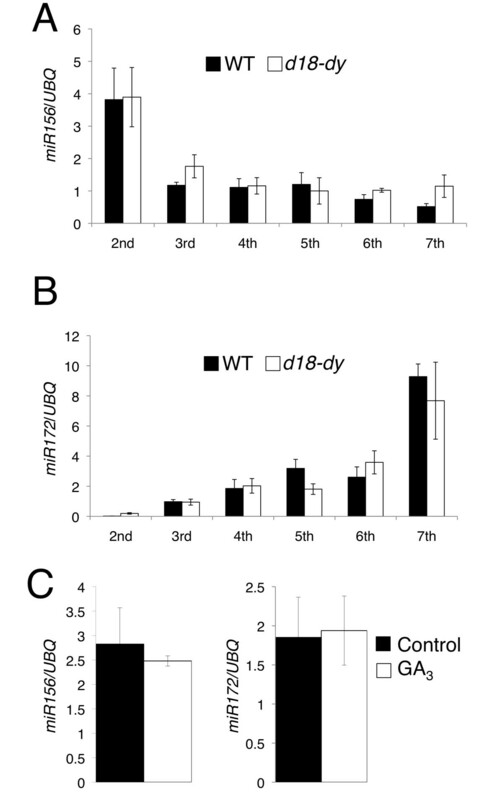 In Arabidopsis, overexpression of miR156 causes a prolonged juvenile phase (Wu and Poethig 2006). In addition, miR156 overexpressed mutant, Corngrass1 (Cg1) shows long juvenile phase in maize (Chuck et al. 2007). 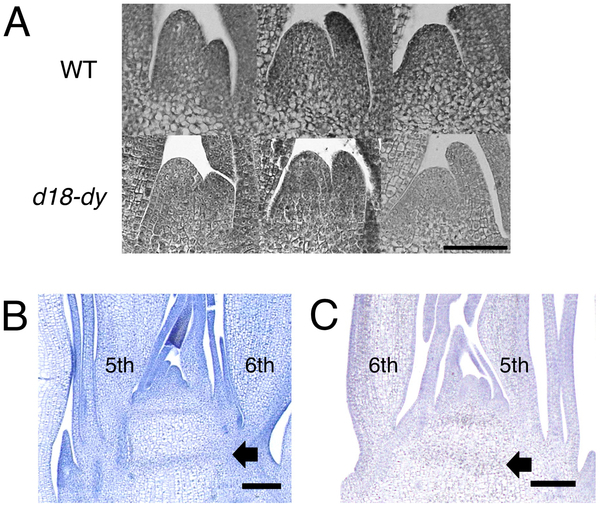 The glossy15 (gl15) mutant shortens the juvenile phase in the maize epidermis (Moose and Sisco 1996); GL15 is an AP2-like gene that is the target of miR172 (Lauter et al. 2005). In addition, miR156 also controls juvenile-adult phase change in trees (Wang et al. 2011). miR156 inhibits juvenile-adult phase change via repression of SQUAMOSA PROMOTER BINDING PROTEIN-LIKE (SPL) family genes resulting in decrease of miR172 (Wu et al. 2009). Thus, miR156 and miR172 are key regulators in the juvenile–adult phase change. Plant hormone Gibberellin (GA) is involved in the regulation of plant growth. GA is also known as adult phase promoter in Arabidopsis and maize (Lawson and Poethig 1995; Telfer et al. 1997; Telfer and Poethig 1998). GA deficient mutant, ga1-3 exhibits dwarfism and glabrous leaf without abaxial trichome in Arabidopsis (Telfer et al. 1997). In maize d1 and d3 mutants, the expression of leaf epidermal wax is prolonged and the expression of leaf epidermal hairs is delayed compared with wild type (Lawson and Poethig 1995). There are a few reports that examine the relationship between miR156 and GA (Schwarz et al. 2008; Wang et al. 2009). Because the expression level of SPL9 was similar in wild type and ga1-3 mutant in Arabidopsis (Wang et al. 2009), miR156 and GA related genes may function independently. However, the relationship between miR156 and GA in juvenile-adult phase change is not confirmative. In rice, a lot of GA-biosynthesis-deficient mutants are reported (Sasaki et al. 2002; Sakamoto et al. 2004). However no reports described how GA is related to juvenile-adult phase change in rice except Tanaka et al. (2011). Almost all molecular genetic studies of juvenile-adult phase change have been confined to Arabidopsis and maize. However, considerable number of morphological and physiological traits known to differ between the juvenile and adult phases are reported in rice, including the size of the shoot apical meristem (SAM), size and shape of leaf blades, presence of midribs, vascular orientation in the stem, node–internode differentiation, and photosynthetic rate (Itoh et al. 2005), thus rice is useful plant to understand the juvenile-adult phase change. In this report, I examined d18-dy mutant from the stand point of juvenile-adult phase change. 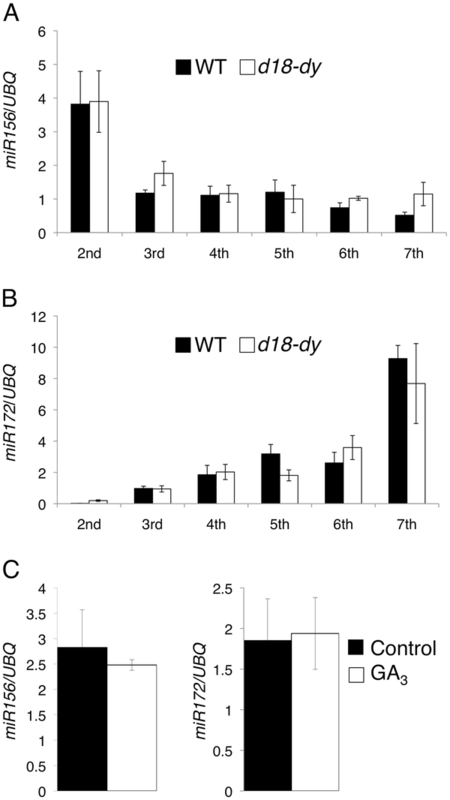 Expression patterns of miR156 and miR172 in d18-dy demonstrate that GA regulates juvenile-adult phase change independently of miR156-related pathway. To confirm the function of GA as adult phase promoter, I examined the phenotypes of GA deficient mutant, d18-dy. Rice D18 encodes GA3ox2, and the loss of function allele d18-dy causes severe dwarfism (Figure 1A). d18-dy has 9 bp deletion in the first exon of GA3ox2 gene (Sakamoto et al. 2004). GA 3-oxidase oxidizes GA20 and GA9 to synthesize active GA, GA1 and GA4. 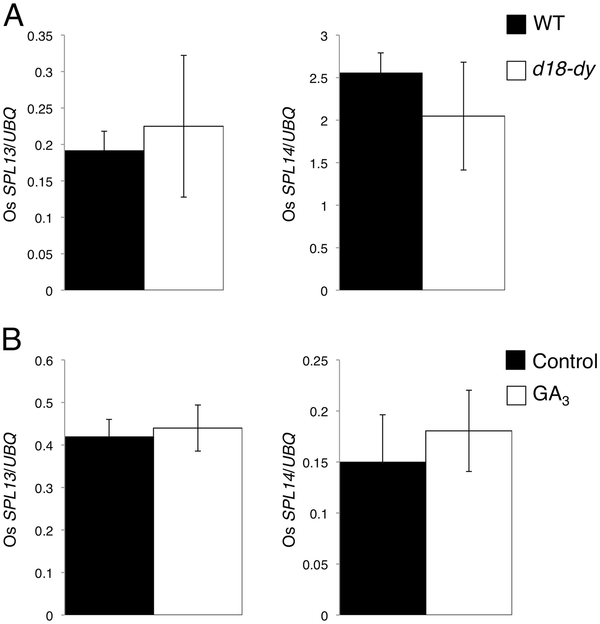 The GA3ox deficient mutant is convenient to understand the function of GA in juvenile-adult phase change. First, I examined leaf shape that is defined as the ratio of leaf blade length to width. In wild type, the ratio drastically increased with elevation of leaf positions (Figure 1B). In d18-dy, even the ratio of the 7th leaf blade was below that of wild type 3rd leaf (Figure 1B). Second, I evaluated the presence of midrib in wild type and d18-dy leaf blades. The extent of midrib formation is a good marker for evaluating the juvenility in rice (Tanaka et al. 2011). I measured relative midrib length from the base of leaf blade. In d18-dy 3rd and 4th leaf blades, midrib covered approximately 20% and 40% of leaf blade, respectively (Figure 1C-E). These values were approximately half of those of wild type (Figure 1E). In both wild type and d18-dy 6th leaf, midrib covered more than 70% of leaf blade (Figure 1E). These results suggest that d18-dy shows prolonged juvenile phase, and it enters adult phase at around 6th leaf stage. Phenotypes of leaf in d18-dy plants. (A) 2-week-old wild type (Taichung 65) and d18-dy. Bar = 5 cm. (B) Change in the ratio of leaf blade length to width in wild type and d18-dy (C) Cross section of d18-dy 3rd leaf blade cut at 25% from the base. (D) Cross section of d18-dy 4th leaf blade cut at 45% from the base. Bars = 100 μm. (E) Change of relative midrib length in leaf blades during development in wild type and d18-dy. Midrib length is shown as a percentage against total blade length. Data represent means ± SD in (B) and (E) (n = 5). Next, I observed the changing pattern of SAM size during development. In d18-dy, SAM remained smaller than that of wild type till the 4th-leaf stage (Figure 2A). Additionally, d18-dy showed different node-internode differentiation. Above the 5th leaf, the stem has obvious node in wild type (Figure 2B). By contrast, node differentiation was not detectable until the insertion of 6th leaf in d18-dy (Figure 2C). These stem structures also indicate that d18-dy has long juvenile phase. From these morphological traits in d18-dy, I concluded that GA promoted juvenile-adult phase change in rice. Phenotypes of SAM and stem in d18-dy plants. (A) Wild type and d18-dy shoot apices showing temporal change of SAM size. From left to right, 2nd leaf stage, 3rd leaf stage and 4th leaf stage. Bar = 50 μm. (B) Longitudinal section of 14-day-old wild type stem. (H) Longitudinal section of 20-day-old d18-dy stem. Arrows indicate leaf base nodes. Bars = 100 μm. To demonstrate the relationship between GA and two miRNAs in juvenile-adult phase change, I examined miR156 and miR172 expression patterns in wild type and d18-dy leaves (Figure 3A,B). In both wild type and d18-dy leaves, expression level of miR156 was the highest in 2nd leaf, rapidly decreased to approximately one-third in 3rd leaf (Figure 3A), and was maintained at low level until the 7th leaf (Figure 3A). Wild type and d18-dy also showed similar expression pattern of miR172: the expression was quite low in 2nd leaf, and increased dramatically toward the 7th leaf (Figure 3B). In conclusion, expression patterns of the two miRNAs in d18-dy were identical to those in wild type (Figure 3A,B). From normal expression patterns of two miRNAs and retarded juvenile-adult phase change in d18-dy, I estimated that GA promotes adult phase transition independently of miR156 and miR172. To confirm the relationship between GA and two miRNAs, I treated wild type plants with GA3. There is a report that the expression level of GA deactivation gene, GA2ox4 is up-regulated by GA treatment (Yamaguchi 2008). In GA treated plants, expression level of GA2ox4 was higher than in control plants (Additional file 1: Figure S1). This indicates that the experimental system of GA treatment is normally functioning. Subsequently I examined miR156 and miR172 expression levels in control and GA3 treated plants. Both expression levels of two miRNAs were not affected by the application of GA3 (Figure 3C). Thus I concluded that GA did not regulate the onset of adult phase upstream of miR156. Relationship between two miRNAs and GA. (A) Expression of miR156 in wild type and d18-dy 2nd to 7th leaves. (B) Expression of miR172 in wild type and d18-dy 2nd to 7th leaves. (C) Expression of miR156 and miR172 in control and GA3 treated 3-day-old plants. Each value is the average of three independent real-time PCR assays. Data in (A), (B) and (C) represent means ± SD (n = 3). To further confirm the hypothesis that GA functions independently of miR156 pathway in juvenile-adult phase change, I examined the expression levels of OsSPL13 and OsSPL14 that are the ortholog of Arabidopsis SPL3 and SPL9 (Xie et al. 2006). Both OsSPL13 and OsSPL14 contain miR156 target sites, and OsSPL14 ortholog, SPL9 regulates miR172 expression positively in Arabidopsis (Wu et al. 2009). The expression levels of both OsSPL13 and OsSPL14 in leaves were almost comparable between wild type and d18-dy (Figure 4A). Next, I examined OsSPL13 and OsSPL14 expression in GA3 treated plants. Both OsSPL13 and OsSPL14 expression levels were similar between control and GA3 treated plants (Figure 4B). These results indicate that GA does not affect the expression of miR156- target genes. I again confirmed that GA-related pathway did not act upstream of miR156. Expression patterns of Os SPL s in d18-dy . (A) Expression of Os SPL13 and Os SPL14 in wild type and d18-dy 2nd leaves. (B) Expression of Os SPL13 and Os SPL14 in control and GA3 treated 3-day-old plants. Each value is the average of three independent real-time PCR assays. Data in (A), (B) and (C) represent means ± SD (n = 3). The study of juvenile-adult phase change is difficult because it is accompanied by subtle morphological traits. In addition, the morphological markers for juvenile-adult phase change are different among plant species. However, miR156 and GA are reported as common juvenile-adult phase change regulator in many flowering plants (Lawson and Poethig 1995; Telfer et al. 1997; Wu et al. 2009; Chuck et al. 2007; Wang et al. 2011; Tanaka et al. 2011). GA-related mutant, d18-dy showed prolonged juvenile phase, such as delayed midrib formation, small leaf size, small SAM size and delayed node-internode differentiation. These results strongly indicate that GA also promotes adult phase transition in rice. The expression patterns of miR156 and miR172 were comparable between wild type and d18-dy plants. These results suggest that GA and miR156 regulate juvenile-adult phase change through independent genetic pathway. Over-expressed MIR156 line in Arabidopsis shows prolonged juvenile phase, however it can enter the reproductive phase (Schwarz et al. 2008). 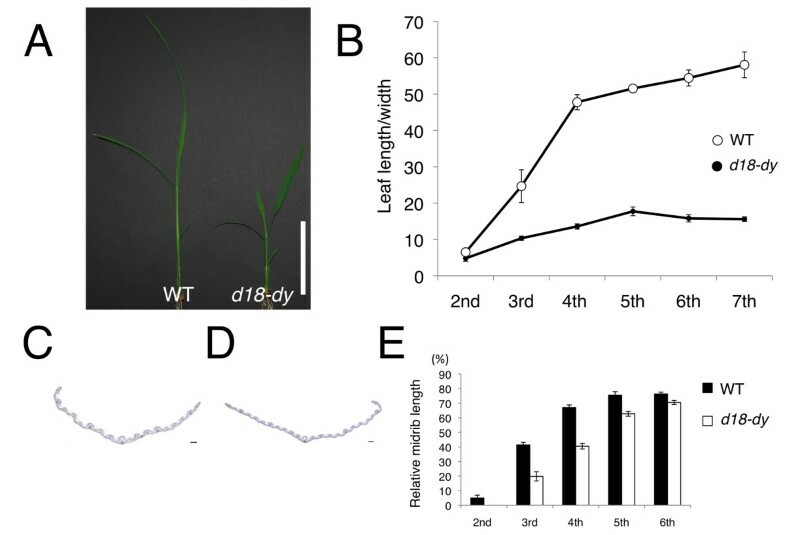 In rice, MIR156 over-expressed plant also showed dwarfism, but developed to flowering stage (Xie et al. 2012). Similarly, GA-deficient mutants can enter the reproductive phase in many flowering plants (Telfer et al. 1997; Itoh et al. 2004). These phenotypes indicate that miR156 functions redundantly with GA in the determination of the exact time of juvenile-adult phase change. Double mutant of MIR156 over-expressed plant and GA deficient mutant might show persistent juvenile phase. In d18-dy 6th leaf stage, the plant was obviously dwarf. This indicates that amount of active GA in d18-dy is still low at 6th leaf stage. However, d18-dy showed normal midrib formation at this stage (Figure 1E). This suggests that the function of GA is less important for midrib formation after 6th leaf stage than during 2nd-to-5th leaf stages. Short plastochron is also known as juvenile phase character in rice (Itoh et al. 2005). MIR156 over-expressed plant had more leaves than wild type (Xie et al. 2012). In contrast, the rate of leaf initiation was comparable between d18-dy and wild type. These indicate that miR156 and GA have different functions in regulation of plastochron. 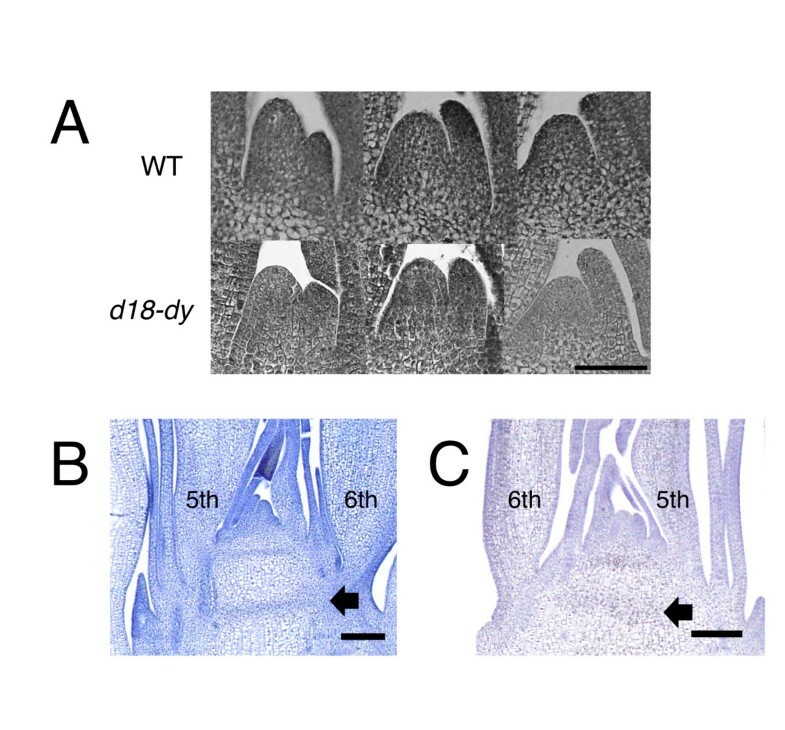 Long juvenile phase phenotype of d18-dy indicated that GA is the adult phase promoter in rice. In higher plants, miR156 and miR172 are also known as juvenile-adult phase change regulator. Our study demonstrated that GA does not regulate juvenile-adult phase change via a pathway of miR156. Moreover, GA does not regulate OsSPL s that are the miR156-target genes. I used d18-dy that is a dwarf mutant defective in GA biosynthestic gene encoding GA3 OXIDASE 2. Mutants and wild type plants were grown in pots under natural field conditions. Leaves and shoot apices were fixed with FAA (formalin:acetic acid:50% ethanol, 1:1:18) for 24 h at 4°C. They were dehydrated in a graded ethanol series and embedded in Paraplast plus (McCormick Scientific). Microtome sections (8 μm thick) were stained with Delafield's hematoxylin. The real-time PCR for miR156 and miR172 was performed using TaqMan MicroRNA Assay (Applied Biosystems). Total RNA was extracted using TRIzol reagent (Invitrogen) from wild type 2nd, 3rd, 4th, 5th, 6th and 7th leaves. In addition, RNA was also isolated from d18-dy 2nd, 3rd, 4th, 5th, 6th and 7th leaves. To quantify the miR156 and miR172 expression, PCR was performed using the TaqMan Fast Universal PCR Master Mix (Applied Biosystem). I used UBQUITIN (UBQ) as inner control and qPCR was conducted using SYBR green master mix (Applied Biosystem). For quantifying the UBQ expression, Real-time PCR was performed using High Capacity RNA-to-cDNA Master Mix (Applied Biosystems). To observe the Os SPL13 and Os SPL14 expressions, total RNA was isolated from wild type and d18-dy 2nd leaves. I used UBQ as inner control and qPCR was conducted using SYBR green master mix (Applied Biosystem). Real-time PCR was performed using High Capacity RNA-to-cDNA Master Mix (Applied Biosystems). For observing miR156, miR172, Os SPL s and GA2ox4 expression patterns in GA treated plants, sterilized seeds of wild type were plated on MS medium (Murashige and Skoog 1962) containing 10-5 M GA3 (SIGMA). Plants were grown in a growth chamber under the continuous light at 28°C. Total RNA was extracted using TRIzol reagent (Invitrogen) from 3-day-old wild type seedlings. To quantify the miR156 and miR172 expression, PCR was performed using the TaqMan Fast Universal PCR Master Mix (Applied Biosystem). I used UBQUITIN (UBQ) as inner control and qPCR was conducted using SYBR green master mix (Applied Biosystem). For quantifying the Os SPL13, Os SPL14 and UBQ expression, Real-time PCR was performed using High Capacity RNA-to-cDNA Master Mix (Applied Biosystems). PCR was performed using the StepOnePlus real-time PCR system (Applied Biosystems). For quantifying the GA2ox4 and UBQ expression, Real-time PCR was performed using PrimeScript RT Master Mix (Takara). qPCR was conducted using SYBR Premix Ex Taq ll (Takara). PCR was performed using Thermal Cycler Dice TP800 (Takara). Gene-specific primes for Os SPL13, Os SPL14 GA2ox4 and UBQ are listed in Additional file 2: Table S1 online. I thank Dr. H Kitano (Nagoya Univ.) for kind gift of d18-dy seeds.